Kendal Castle was originally a late 12th century earth ringwork and bailey fortress, founded by Gilbert fitz Reinfred. In the early 13th century, William de Lancaster founded the stone castle, when encasing the ringwork with a curtain wall. In 1383, it became the possession of the Parrs and in 1571 the ruinous and abandoned castle passed by exchange to the crown. Successor of Castle Howe Kendal, the circular inner ward is encased by a wide ditch, with an outer rampart and fragments of the curtain wall. Square and round towers flank the wall along with, on the southern side a 14th century rectangular keep. Opposite the keep are the remains of the Great Hall, built over two vaulted basements and the traces of a gatehouse, defended by an earthwork barbican. 5 miles south is Sizergh Castle. 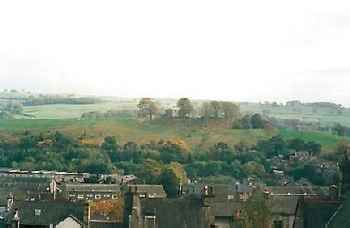 Kendal Castle is located above the town centre, off Park Side Road. 23 miles north of Lancaster on the M6-A591. The site is owned by South Lakeland District Council and is freely accessible in daylight hours.